For it is in the giving that we receive. Music has always played a large part in worship at St Francis. The first sung Eucharist was held on Christmas Morning 1930 in a School room of Ladywood School situated at the top of Scads Hill on the corner of Grosvenor Road. The seeds of this tradition of sung services remains strong to this day, however we need rewind a bit. Well, Hardman’s own church possessed a strong Anglo-Catholic tradition from the time Francis Harry Murray had been appointed to the parish. Canon Murray was part of the Oxford Movement founded in 1834 which advocated daily Eucharists sung on Sundays and Holy Days, daily Matins and Evensong which had led to the gospel being spread to darkest corners of England and along with another Rector Dawson, set up a mission in Rotherhithe, it seemed a fitting tribute to take as its patron saint the Christian name of one Rector and a favorite saint of the other, and so - St Francis or The “Little Church in the Bluebell Wood” as it nestled amongst the trees and the promise of wild flowers and singing birds, this little building situated beside National Trust woodland, bluebells and silver birch, the saint renowned for his passionate devotion to God and his love of nature was an appropriate choice. Rev James Robert Hampson experience of WW1 had led him along with others to realise his call to the church, after a stint at Chislehurst saw a spiritual vacuum and by November 1930 was giving the whole of his time to Petts Wood, encouraging the new residents to build their church financially and spiritually. Monies had been raised in weekly collections, James Hampson had called at least once to all the houses in the area, sign posts were put up to make the church easier to find and in Easter 1933, 287 communicants were packed in to somewhat uncomfortably into four services of Eucharist. A harmonium had been given by a Miss Plummer along with a Chalice and paten, a small figure of St Francis and a Coptic Cross all added to the worship. The Harmonium very much helped the congregation to sing in the confined space of this temporary church, first without a choir, but in 1934 James Kensey, the organist, started up the choir, who by Maundy Thursday 9th April 1936 were proficient enough to perform Stainer’s Crucifixion at the Dedication service of the new Church. By December 1934 the new church stood proud and dignified rising about the houses of Petts Wood. Many of the furnishing were generously provided by many donors. The Harmonium had been removed from the little wooden church and installed in the church, but its sound was rather diminished by the size and acoustics of the new brick church building. On 12 May 1937 the congregation heard a full organ in church for the first time as Williamson’s, the electrical shop in Station Square, installed large loudspeakers linked to a wireless broadcasting the coronation service of King George the sixth from Westminster Abbey. This inspired the creation of an organ fund and research began. 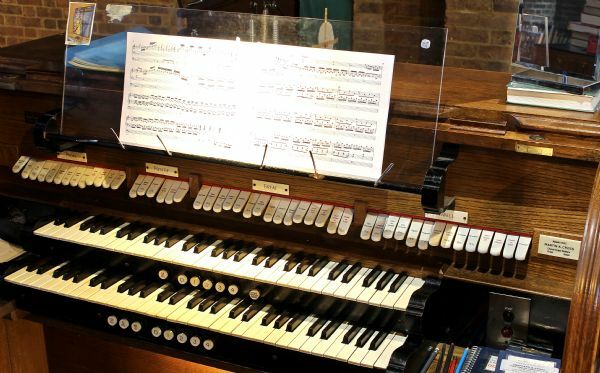 The cost of a new organ was £1600 (more than the price of a new house in Petts Wood). 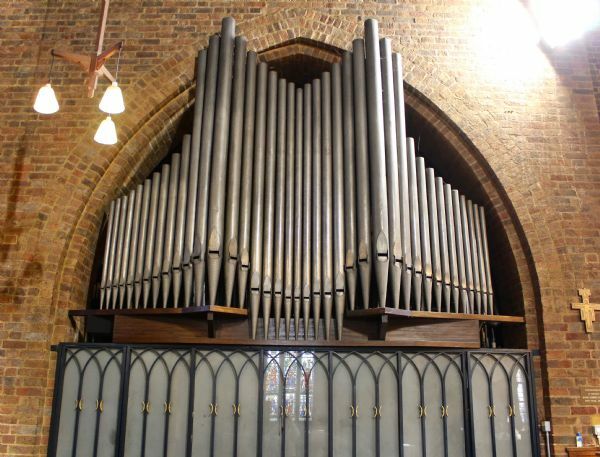 A newly developed electronic Hammond organ was about half this, but the Church Council were reluctant to depart from a true and trusted pipe organ and that November they had news of a second-hand Henry Willis & Sons two manual pipe organ available in London for £200. An additional £188 was needed to pay for its removal and installation and Rev. Hampson invited bids ranging from a half crown to a guinea for each of the 1600 pipes. In January 1939 Arthur Coventon, honorary organist at the time, gave a series of recitals after Evensong to demonstrate the range of this new addition to the church. The bomb which gave us our east window also caused significant damage to the roof and less than a year after its arrival the organ suffered severely from water damage. Insurance and the War Damage Commission covered most of the cost of repairs. In the two years immediately after the war, J Lewis Stopes helped revive the musical life by holding a one day “choir school” with the Royal School of Music, for 130 members of other church choirs. This was held on 9th February 1946. On September he held a ‘Choir Festival with the organist from St Pauls Cathedral Dr J Dykes-Bower. played a range of music from Bach to Bridge. Arising from that experience it was clear that substantial restoration work was once again required. This work, including the addition and re-positioning of some pipes, took place from August to December 1982 at a cost of £15,000. As always, the up keep of instruments such as these never stands still, and again in 2004/5 another restoration took place, sponsorship of the many pipes took place to help with the cost, and again in 2007 cleaning and an overhaul was carried out. Time doesn’t stand still for this beautiful instrument, the sound it creates within the church brings the souls of the past to life, their struggles to breathe life in to their church still continues to this day.